Today's short is an introduction to "The Collected Papers of Albert Einstein: The Digital Edition". The Website provides access to all volumes of Einstein's collected papers, which number some 5,000 documents covering the first 44 years of the scientist's life. Albert Einstein (1879-1955) was awarded the Nobel Prize in Physics in 1921. Additional useful links are found on the Links page of the official Albert Einstein Website. ✦ Rhode Island glass artist Steven Weinberg works with cast and cut glass, creating extraordinary artworks that can be found in the collections of more than 50 public art museums around the world. He started in the mid-1970s using glass architectural construction blocks; in the early 1980s, he transposed interior of grids to the outside to produce three-dimensional optical puzzles; in the 1990s, he turned his attention to cubes and added color for contrast, thereafter focusing on marvelous boat forms (1993-2003) and mandalas (2005-present), drawing inspiration from his visits to China. Visit his Website galleries, beginning with the 1970s, and then take a look at some of his unique commissions, which include glassware for Swarovski and beautiful architectural installations. ✦ New York City's Pure Vision Arts, founded by Shield Institute, describes itself as the first art studio for people on the autism spectrum. Read a Smithsonian magazine feature on PVA, "This Art Studio Nurtures Talent in People on the Autism Spectrum". The largely self-taught artists have exhibits, welcome studio visitors, and sell their work. Also see this video posted in early 2014. ✦ Save the Date of Friday, March 6, 5:00 - 6:30 p.m., for the 15th Annual Developmental Disabilities Awareness Art Fair at Missouri History Museum. All of the artworks are by St. Louis Public Schools students. ✦ My friend Judith Olivia HeartSong, owner/founder of Artists and Makers Studios and founder, Salon: An Artful Conversation, shared the following film in which painter Alyssa Monks, who lives in Brooklyn, talks about her creative inspiration and process: ". . . the thing we all really want is to feel connected." The video is part of the series Making Art New York on Vimeo. Watch another lovely film with Monks, this one by Trent Jaklitsch. View Monks's paintings. Connection from Jesse Brass on Vimeo. Monks will be exhibiting in "Small Works" at Sirona Fine Art Gallery, Hallandale Beach, Florida, through February 15. ✭ In the Emerson Gallery at McLean Project for the Arts, McLean, Virginia, Joan Belmar, Annie Farrar, and Barbara Josephs Liotta explore physical science through art. In addition to natural phenomena, the three artists demonstrate, in sculpture and mixed-media artworks, conceptual and literal aspects of force, motion, energy, and matter. The curated show, "Manifesting Phenomena: Drop, Hover, See-Through, Lean. . . .", continues through March 7. Spend some time on these artists' Websites; they are all terrific. ✭ Artist-to-watch Heidi Howard, a figurative painter, is exhibiting work through Valentine's Day in "Heidi Howard | Portrait & Dream" at Nancy Margolis Gallery, New York City. 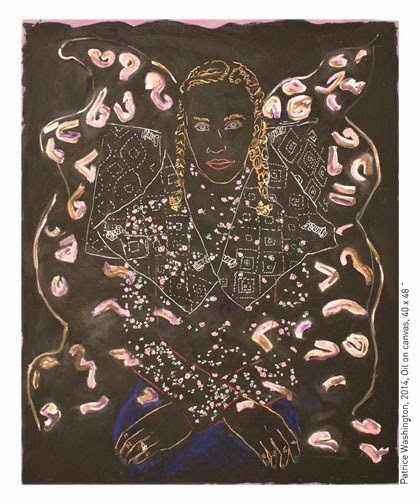 This is Howard's first solo exhibition at NMG, which included her among five featured artists the gallery presented this past December at the Miami Project. View additional images. ✭ Missouri's nonprofit Art St. Louis Gallery is presenting 38 works by 30 artists in the juried group show "Painting: Reconsidered, Deconstructed", a multi-media exploration of paint as material and as object, on view through February 19. The artists, all of whom are from Missouri or Illinois, include Natalie Avondet, Christine Giancola, Sarah Gillespie, Sonja Petermann, and John Marksbury (see complete artist list). In addition to paintings, the media include drawings, photographs, prints, and sculpture, as well as digital media. A gallery talk with four of the exhibiting artists (Anika Britt, Shawn Burkard, Samuel J. Cummings, and Michael Rudolf) is scheduled for February 7 at 11:00 a.m.
✭ Beginning in February, selections from Rebecca Norris Webb's My Dakota series (see slideshow at link; the photographs also comprise a book) will be on view at Blue Sky Gallery, Oregon Center for the Photographic Arts, Portland. Norris Webb's book Memory City (Radius Books) was selected by Teju Cole for The New Yorker's The Best Books of 2014. ✭ Flatbed Press and Gallery, Austin, Texas, continues through March 1 an exhibition of master prints by Peregrine Press, a Dallas, Texas, fine art press that operated from 1981 to 1991, publishing works by a major group of Texas-based artists, including John Alexander, David Bates, Otis Dozier, Susan Harrington, Peter Julian, Dan Rizzie, Andrea Rosenberg, Frank X Tolbert 2, Judy Youngblood, and Miguel Zapata. The show, "Peregrine Press: A Texas Legacy", features more than 40 works from the press, many still available for purchase. I am obsessed with snow. You may already be tired of snow but have you ever taken a moment to see it the way a photographer does? Today, you'll find me at Escape Into Life, where I've posted a new Artist Watch column showcasing the lovely winter photography of Skye Sadowski-Malcom. Malcom, a resident of Baltimore, Maryland, where she lives with her husband and three children, plays the fiddle in two bands but says that photography remains her constant, abiding passion. 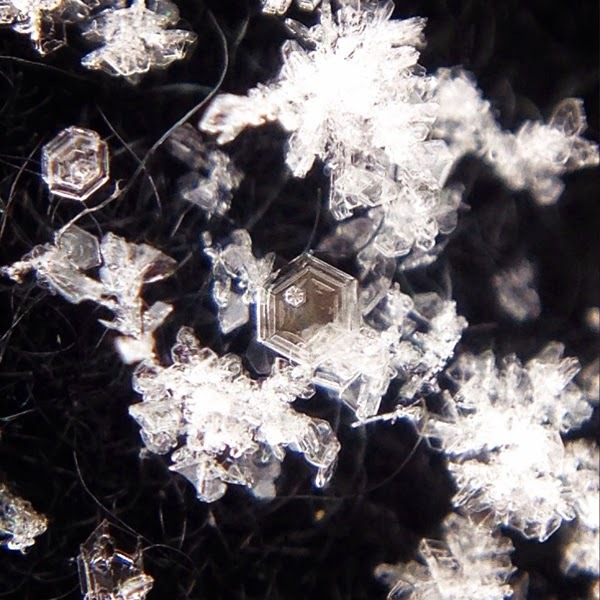 My Artist Watch post includes eight images of Malcom's beautiful, up-close snowflakes, which she photographs with a macro lens. The feature also includes her Artist Statement about her series, a brief biography, and a link to her new Etsy shop, where prints of her work are available. Kemp is the subject of Matthew Killip's film (see the video below), which premiered at The New York Times T Magazine. Kemp, who has been enthralled by the beauty of the organisms since he was a teenager, learned on his own how to become a diatomist, following the practice as it was done in the Victorian era. His creations are stunning collectibles. Visit Klaus Kemp at Microlife Services, where you'll find a Diatom Database, the image of the month, and The Amateur Diatomist Website. The California Academy of Sciences has a collection of diatom arrangements, which include arrangements by R.F. Behan, R.I. Firth, W.M. Grant, and A.L. Brigger, none scientists. Go to Flickr to see more of these arrangements from the CAS collection. My poem below was published as part of a TweetSpeak Poetry post of New Year poetry. I don't think I ever posted it here at my own blog. Enjoy! Tuesday, February 10, begins the final series of readings in the 2014-15 series of Lannan Readings at Georgetown University, Washington, D.C. All of the events are free and open to the public, and all take place at 8:00 p.m., on campus in the Copley Formal Lounge (37th & O Sts., N.W.). Today's post spotlights the readings, which will continue into April. ✭ Nairobi-born Okwiri Oduor appears on February 10. Winner of the Caine Prize for African Writing (2014), for her story "My Father's Head", which appears in Feast, Famine and Potluck (Short Story Day Africa, 2014), Oduor teaches creative writing to young girls who attend her alma mater in Kenya. Currently, the writer, a MacDowell Colony Fellow (2014), is working on a full-length novel. She is the author of a novella The Dream Chasers. ✭ On February 24, poet, novelist, translator, critic, and scholar Ammiel Alcalay will be joined on the podium by poet and writer Fanny Howe. Alcalay is the author of a little history (re:public/UpSet Press, 2013), Islanders (City Lights, 2010), Scrapmetal (Factory School, 2007), and After Jews and Arabs: Remaking Levantine Culture (University of Minnesota Press, 1993), in addition to other books. Read Ammiel Alcalay's poem "Order". Poet and novelist Howe has published more than 20 books of prose and poetry, most recently the collection Second Childhood (Graywolf Press, July 2014). Recipient of the Ruth Lilly Poetry Prize (2009), Howe also has been awarded fellowships from Bunting Institute, MacDowell Colony, and National Endowment for the Arts. Howe is a Visiting Lecturer in Literary Arts at Brown University. Read Fanny Howe's poems "The Hut" and "Veteran". ✭ March 17 will bring together poets Peter Gizzi and Michael Palmer. Gizzi is the recipient of a Lavan Younger Poets Award (19940 from the Academy of American Poets and, more recently, a Guggenheim Foundation fellowship, among other honors; he was the 2011 Judith E. Wilson Visiting Fellow in Poetry at Cambridge University. He published this year In Defense of Nothing: Selected Poems 1987-2011 (Wesleyan). His most recent chapbook is In the Air (Manor House, 2013), with artwork by Richard Kraft. A collaborator with visual artists and composers, Palmer published his first poetry collection, Blake's Newton (Black Sparrow Press, now Black Sparrow Books) in the early 1970s. His awards include a fellowship from the Guggenheim Foundation (1989) and the 2001 Shelley Memorial Award (Poetry Society of America). Read Michael Palmer's poem "Stone". ✭ Closing out the season on April 21 is Ethiopian-born Dinaw Mengestu. The recipient of a MacArthur Genius Grant (2012), a "5 Under 35" Award from the National Book Foundation (2007), and a fiction fellowship from the New York Foundation for the Arts (2006), Mengestu has written three novels: All Our Names (Knopf, 2014 ), How to Read the Air (Riverhead Trade, 2010; Reprint 2011), and The Beautiful Things That Heaven Bears (Riverhead Books, 2008; Reprint 2008). The latter is the winner of a Guardian First Book Award. How is it that fear can also burnish the world? I have found a connection between drawing and sculpting. out of the wood when sculpting. . . .
Today's short, from Maryland Public Television, offers a brief look at the unusual and beautiful abstract furniture and sculptures created by David Knopp. In the video, Knopp discusses his materials (plywood laminate), his tools, and his artistic process. Knopp, based in Baltimore, Maryland, begins with photographs, which become drawings that he then "interprets" (with the aid of 3-D design software) into fluid wood forms. Browse Knopp's online portfolio. Knopp was a finalist for a NICHE award in 20l1 and is a past winner (2012) of a Baker Artist Award. Art Loft 301's "David Knopp, Plywood Artist" (2014) also may be viewed on YouTube. ✦ It seems there is always room for another art-related site on the Web. One of the more recent is The Artist Next Level (TANL), which describes its objectives as "inspire[ing] you to thrive and succeed in your art career through our free podcasts, webinars, seminars, social groups, [and] personal/virtual coaching and offer technology to create a scalable business. . . ." Take a look for yourself. The platform was created by Chicago visual artist and entrepreneur Sergio Gomez, psychologist Yanina Gomez, Ph.D., and 33 Contemporary Gallery. Easily navigated, the site also contains a Resources page and a link to Sergio Gomez Art Blog. Interviews and other features are planned. ✦ Contemporary London-based sculptor Anish Kapoor will be showing work at Versailles this year, from June through October. Kapoor's will be a solo exhibition at the 17th Century palace outside Paris. ✦ Here's a stellar contemporary textile/mixed-media artist I recently found online: Gizella K Warburton. Visit her gallery to view examples of her work, which are composed of cloth, papers, yarns, strings, paint, charcoal, or weathered wood, among other materials. Warburton, who lives and works in Leicestershire, East Midlands, United Kingdom, takes commissions and conducts workshops. Warburton last showed her work at the Affordable Art Fair in Battersea. Read an interview with Warburton at TextileArtist. ✦ Today's feature video introduces sculptor and installation artist Soo Sunny Park. Park talks about her piece, Unwoven Light, a 2013 installation at Rice Gallery. ✭ Paintings by Argentinian Raul Diaz remain on view through February 28 in the exhibition "Journey" at Jerald Melberg Gallery, Charlotte, North Carolina. Diaz's art comprises works on paper (watercolor and pencil, oil crayon and graphite), sculptures, and paintings or carvings on wood or wood panels, as well as mixed media on wood panels. His use of color gives his work an appearance of delicacy or dreaminess, imbuing the paintings with atmosphere, and the expressive figures or objects he includes lend them mystery. He calls painting, which he says he's "connected to all day" while secluded in his studio overlooking the mountains, a form of autobiography. A 2002 monograph, Raul Diaz, including 100 color plates, is available from Jerald Melberg. ✭ A solo show of seven new narrative-style works by ceramic sculptor Jason Walker, a Northwest artist represented by Ferrin Contemporary, continues through March 1 at Bellevue Arts Museum, Bellevue, Washington. 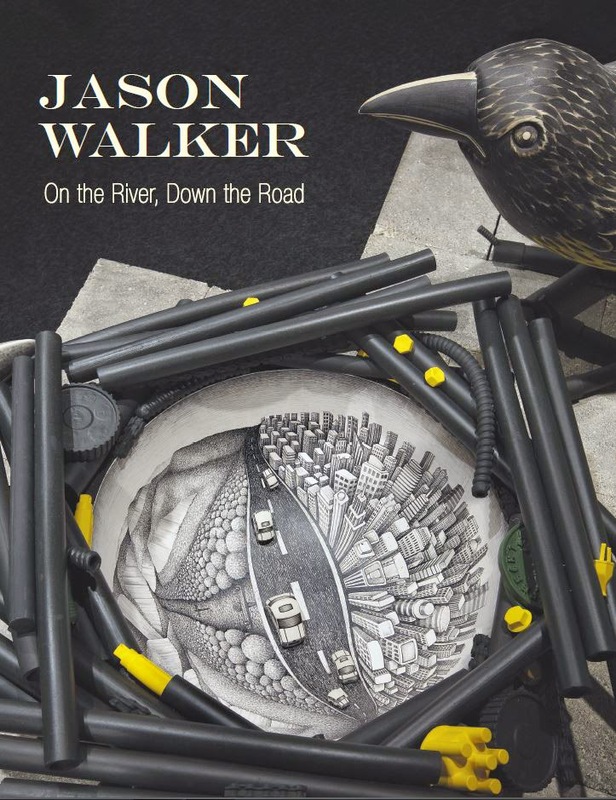 Titled "Jason Walker: On the River, Down the Road", the exhibition is site-specific, comprising an installation of painted porcelains, primarily in the form of animals in surrealistic settings, that "offers an incisive comment on the indelible impact of humanity upon the natural landscape." View a selection of exhibition images. A color catalogue, including an interview with the artist, is available through Ferrin Contemporary. ✭ Celebrating its 90th anniversary, Mulvane Art Museum at Washburn University, Topeka, Kansas, is showing selections from its permanent collection of more than 3,000 works. On view through March 14 in "Masters of the Mulvane" are artworks by Rembrandt, Goya, Whistler, Tiffany, Picasso, Dali, Rauschenberg, and Max Beckman, Gordon Parks, Miriam Shapiro, and Juane Quick-to-See Smith. ✭ Opened January 5, "Whistler and the British Etching Revival" at Philbrook Museum of Art, Tulsa, Oklahoma, runs through April 5. Drawn from the museum's permanent collection, the exhibition presents prints by James McNeill Whistler (1834-1903), Francis Seymour Haden (1818-1910), Whistler's brother-in-law, who was both an artist and print collector, and several artists of the next generation. The show also demonstrates the medium of etching (an etching needle is on display) and examines practices that have ensured the etching's continuing appeal. Today's Thursday's Three column spotlights a trio of recently published art books, all from Yale University Press. 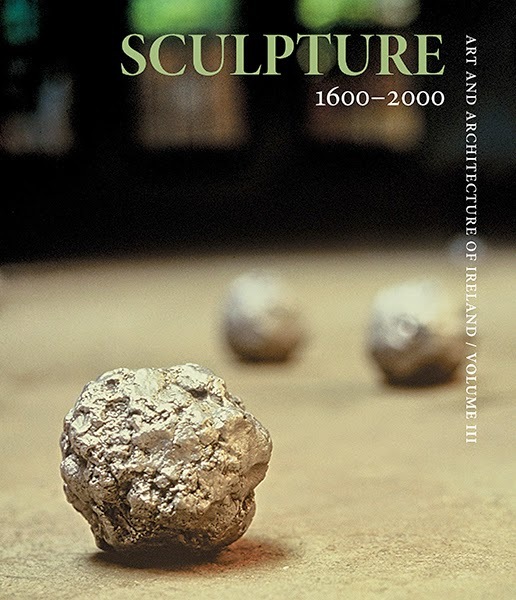 ✭ In Sculpture 1600-2000 (Art and Architecture of Ireland), editor Paula Murphy of University College Dublin offers a survey of four centuries (from early Middle Ages to end of 20th Century) of Irish sculpture. She includes biographies of artists, analytical assessments, and thematic essays. Six hundred color illustrations are featured. 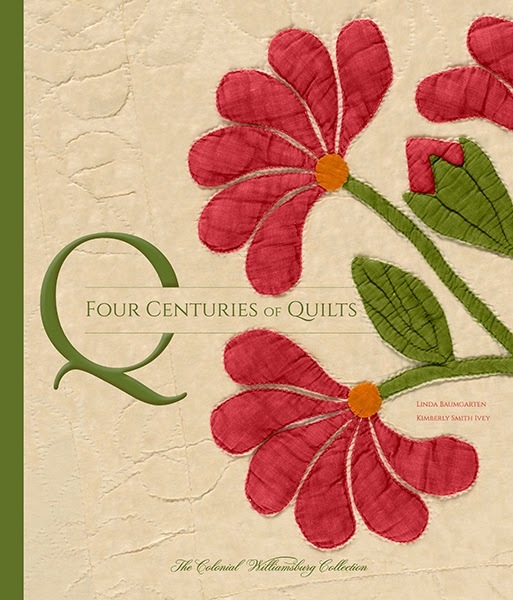 ✭ Drawing on the collection of Colonial Williamsburg Foundation, Four Centuries of Quilts (October 28, 2014), by Linda Baumgarten and Kimberly Smith Ivey, examine the evolution of quilting styles and trends and their relationship to social, political, and economic issues of the art objects' time. The book includes more than 300 color images. A related exhibition, "A Celebration of American Quilts", is ongoing (through June 2016) at Abby Aldrich Rockefeller Folk Art Museum. 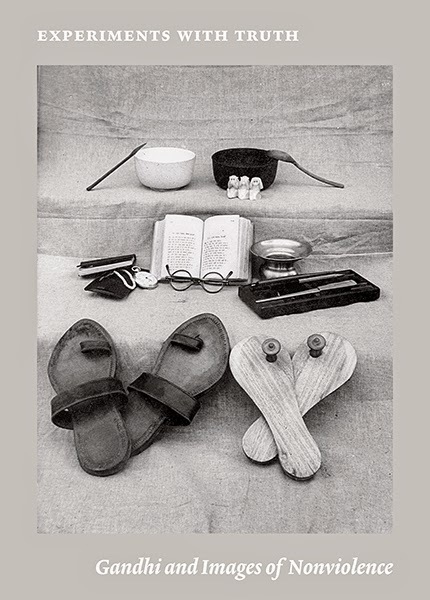 ✭ Mohandas K. Gandhi's ethics of nonviolence are explored through a visual arts lens in Experiments with Truth: Gandhi and Images of Nonviolence (December 23, 2014), edited by Josef Helfensein and Joseph N. Newland, both at The Menil Collection, Houston, Texas. Work discussed encompasses images of Gandhi iconography, photojournalism, and paintings and artworks in other media, both past and contemporary; sacred texts and correspondence also are featured. A related exhibition of the same name, featuring approximately 130 objects, including paintings, drawings, sculptures, photographs, rare books, and films, is at The Menil Collection; it continues through February 1.
. . . In prison, you can't dream . . . But we dared to dream, and to dream a lot. In the wonderful TEDx video below, Cristina Domenech talks about her experience of teaching poetry to men incarcerated in an Argentinian prison. Poetry exists even in a prison, Domenech says she told the men, who soon learned that with the language they could not be denied, "they could make the walls invisible, that they could make the windows yell, and that we could hide inside the shadows." Through her writing workshop, Domenech stresses, the prisoners were able to enjoy "a moment of extraordinary freedom", of dignity as human beings: "Poetry . . . sews up the wounds of exclusion. It opens doors. Poetry works as a mirror. It creates a mirror, which is the poem. They recognize themselves, they look at themselves in the poem and write from who they are, and are from what they write." Proof of the truth of Domenech's words is the appearance at the conclusion of the talk of prisoner Martin Bustamante, who was granted temporary release to read a poem he wrote in Domenech's class. As Bustamante relates, "for me, poetry and literature have changed my life." Last year, I read Richard Shelton's excellent memoir, Crossing the Yard: Thirty Years as a Prison Volunteer (University of Arizona Press, 2007), about teaching poetry in Arizona's prisons. It is an enlightening, inspiring, and enraging read on the horrors of prison life, the sparking of creative spirit, and the possibility of redemption through art. I also recommend former North Carolina poet laureate Joseph Bathanti's collection Concertina, which I reviewed in December 2013. PEN has operated a prison writing program since 1971 and makes available a Handbook for Writers in Prison. Among other resources to note are the American Prison Writing Archive at Digital Humanities Initiative, Hero's Journey Prison Writing Program in Seattle, Washington, The Prison Arts Coalition, The Prison Creative Arts Project at University of Michigan, and Writers in Prison Foundation. There are thousands of other groups throughout the United States and abroad. Many, many books and periodical articles on the subject have been published. of gravity continue to capture my attention. Increasingly, I want my work to sit still. In the video below, by Devin Altobello, ceramic sculptor George Mason, a co-founder of Maine's Watershed Center for the Ceramic Arts, talks eloquently about his artwork. His gorgeous, wonderfully textured "relief tapestries" are wall-size, free-standing pieced-panels; his materials, in addition to clay, include plaster, pigment, casein paint, layered paper-cuts, and encaustic. The Holocaust and Human Rights Center of Maine at the University of Maine, Augusta, included Mason's sculptures in its exhibition "The Dilemma of Memory: Maine Artists and the Holocaust"* this past fall. Mason maintains a studio in Nobleboro, Maine (Damariscotta Mills), and welcomes visitors. George Mason: Artist Profile from Devin L Altobello on Vimeo. Also see "Step by Step, Artist's Process", another excellent video in which Mason describes his creative and physical work processes. Note how beautifully his work complements the spaces for which Mason creates. I particularly appreciate that he creates with the intention of producing an opportunity for "an utterly fresh response"** that calls out to people to touch his work. On Wednesday, January 7, 2015, I watched a 29:56-minute-long video released by the City of Cleveland, Ohio, as part of more extensive surveillance footage of a park where, on November 22, 2014, the 12-year-old child Tamir Rice, playing with a fake BB gun, was shot and killed by a police officer. The child was shot twice, twice within two seconds of the officer's arrival on the scene. Watching the video, I was horror-struck by the length of time that elapsed between the shooting and the arrival of emergency medical assistance, and also by the tackling of another child, a 14-year-old later identified as Tamir Rice's sister, who was hand-cuffed and placed in the back of the police car. From that position, she watched as her brother lay on the ground, unattended; at a later point still, she saw his body removed. We do not see her release from police custody. As is stated in the article accompanying the video, when Tamir Rice's mother tried to come to the sister's aid and asked that she be released, the police gave her the untenable option to either stay with her daughter or go to the hospital; she choose to do the latter. A new law, Amended Substitute Senate Bill 84, establishes the position of Ohio Poet Laureate, making the state the forty-fifth with an official state poet. Signed by Governor John Kasich on December 19, 2014, the law (Ohio Revised Code, Sec. 3379.12) stipulates that selection of the state poet is to be made by the governor from a slate of at least three candidates recommended by the Ohio Arts Council. The council, tasked with establishing qualifications for the position, as well as guidelines for the nomination and selection process, is to submit its recommendations to the governor at least 90 days before the position's term begins. Each appointment is for two years. The term of the state's first Poet Laureate is to begin on January 1, 2016. The governor has discretion to reappoint the incumbent to a subsequent term or terms. If an incumbent dies, resigns, or otherwise vacates or is unable to complete the term of office, the governor may, at the art council's recommendation, appoint another individual to fulfill the unexpired portion. The council has 60 days from the time a vacancy occurs to make its recommendation. No provision is made for a monetary stipend to support the Poet Laureate's work. The law is effective 90 days after being signed. Note: A Monday Muse profile of the inaugural Poet Laureate will be posted following the individual's appointment. Quoted from Tapiwa Mugabe's poem "You Are Oceanic". Mugabe's debut collection of poetry is Zimbabwe, available through Etsy. Today's short is Houshi (meaning Buddhist priest), about Houshi Ryokan, in Komatsu, in Ishikawa Prefecture in Japan. Founded approximately 1,300 years ago, in the year 717, the traditional Japanese-style hotel (ryokan) is the oldest, still-running family business in the world. Some parts of the hotel and its gardens, managed since its founding by members of the Houshi family, are more than 400 years old, according to the description accompanying the video, which is in Japanese with English subtitles. Photography and production are by Fritz Schumann. Also see: "Hoshi Ryokan: The World's Oldest Guest House" at The Most Famous Hotels in the World. ✦ Intricate work by paper-carver Maude White, who lives in New York's Hudson Valley, will leave you in awe. Browse a selection of her gorgeous paper art, including her map birds and water pieces, and then head to her Instagram account to see her latest projects. ✦ Clay is transformed in the hands of Hiroshi Sueyoshi, who lives in North Carolina. The master potter, whose work is in corporate, institutional, and private collections throughout the United States, conducts eight-week workshops at numerous venues. An exhibition of work ("Hiroshi Sueyoshi: Matter of Reverence") from his more than 40-year career is on view through April 12 at Cameron Art Museum in Wilmington. Beginning May 1, his sculptural vessels will be exhibited with work by North Carolina potter Daniel Johnston in "Daniel Johnston | Hiroshi Sueyoshi: Sculptural Clay", at Greenhill gallery in Greensboro. Colored Procelain, 10.25" x 9.5" x 9.5"
Two of Sueyoshi's gorgeous pieces are in the collection of Washington, D.C.'s Smithsonian American Art Museum; see them here. ✦ If you've never seen the origami of late artist Eric Joisel (1956-2010), you're in for a treat. View a n online slideshow of his astonishing folded-paper sculptures. Among them are animals, musicians, gargoyles, Barbarians, and Commedia dell'arte figures. Here's a short 2006 video about the artist. ✦ I first came to art collecting through prints, and I continue to enjoy discovering printmakers. New on my radar is Janis Goodman of the United Kingdom. Take a look at her Murmuration and Tangled Wood on her New Work page, and you'll understand why I'm drawn to Goodman's monochrome etchings. ✦ Another fine printmaker, found through a link at Janis Goodman's Website, is Hester Cox, whose speciality is collagraphs (Goodman's notes on her print techniques are here). View the online gallery, especially the section Drawing on the Past and Vale of York Viking Hoard. 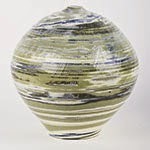 Cox's work is paired with ceramics by Charlotte Morrison in an exhibition, "New Ground", running through January 25 at The Moors National Park Centre, Danby, North York Moors. In the excellent film below, produced by photographer Paul Harris, Cox talks about her artistic inspiration and process. ✭ Oklahoma's Gilcrease Museum at the University of Tulsa continues its exhibition "Private Collections to Public Treasures: New Acquisitions" through March 29. Since 2008, the museum has added more than 13,500 items, comprising both donations and purchases. Among the latter, acquired with donor funds, is the Britzman-Russell Research Collection, consisting of thousands of objects made or owned by western artist Charles M. Russell. Included in the exhibition is Edgar Payne's oil painting Sunshine and Shadows, a rare Cherokee bandolier bag and Cherokee moccasins of leather and beads, the Earl Biss Jr. oil painting Riders in the Storm, and Joseph Henry Sharp's oil on canvas Portrait of Mrs. J.H. Sharp (Addie Bynum Sharp). Images may be viewed at the exhibition link above. ✭ If you're in Chicago, don't be shy about stepping into Jesus Rafel Soto's Penetrable de Chicago (1971) at The Art Institute of Chicago. The guards won't interfere. Soto's installation, one of approximately 30 created by the Venezuelan artist (1923-2005), is on display for the first time since 1986, and viewers' interaction with the work is welcome. The piece comprises thousands of transparent filaments hanging from the ceiling in rectangular formation. As visitors move, so, too, do the shimmering plastic (nylon) tubes. Described as a "luminous environmental sculpture", the work remains on view through March 8. View the site-specific Penetrable de Houston (2004-14) and watch a video. ✭ At Pratt Institute's Pratt Manhattan Gallery, New York City, you'll find "Dust, Dialogue and Uncertainty: Slow Knowledge in Design Thinking and Practice". Continuing through February 7, the exhibition addresses philosophical and creative challenges to contemporary design. According to exhibition information, it aims to show how "slow knowledge" can "bring holistic, reflexive, and critical perspectives to design thinking and practice" to support "more balanced and inclusive" forms of living. Participating artists and designers include Amy Franceschini, founder of Futurefarmers, an international collective; Julia Mandle, Lucie Libotte, and Mayke Nas. See David Orr's The Nature of Design (Oxford University Press, 2002; paperback, 2004), which includes a chapter on slow knowledge. Also see Abraham Verghese, "Slow versus Fast Knowledge", The Atlantic, December 14, 2009; and SlowLab - A Slow Design Network, a collaborator in the exhibition (SlowLab Website; video below). Slow Design Knowledge Platform from slowLab on Vimeo. ✭ A selection of Louise Nevelson (1899-1988) prints drawn from the collection of the Los Angeles County Music of Art appears in "Louise Nevelson in L.A.: Tamarind Workshop Lithographs from the 1960s". Nevelson, primarily a sculptor, created her prints using both unusual materials and unorthodox materials, such as irregularly shaped paper or cheesecloth and such inked objects as lace and erasers. During her six-week residency at Tamarind in 1963, Nevelson completed 26 lithographic editions. She visited Tamarind again in 1967, bringing to 42 the number of print editions she made there. The LACMA show is up through May 17. Four of the prints Nevelson created in 1963 that were published by Tamarind are in the collections of The Art Institute of Chicago; one, also from 1963, is in the collection of the Smithsonian American Art Museum in Washington, D.C. Others can be found in the collections of other art institutions. Images of some Tamarind prints, including Night Image and Meditation at Noon, may be viewed at Spaightwood Galleries. ✭ Ongoing at the Dallas Museum of Art is "Add to, Take Away: Artistry and Innovation in African Textiles". Drawn primarily from DAM's own collection, the textiles on view come from Mali, Republic of Benin, Nigeria, Cameroon, and Ethiopia. All exemplify the "add to" and "take away" techniques used even today to decorate cloth. The former technique generally involves embroidery and appliqué or similar techniques; the latter calls for for the removal of threads to create intricate patterns. Images may be viewed at the exhibition link above. A slideshow also is available at Architectural Digest. The exhibition continues through December 6, 2015. I'm pleased to introduce the work of Dean Pasch in today's Artist Watch feature at Escape Into Life. 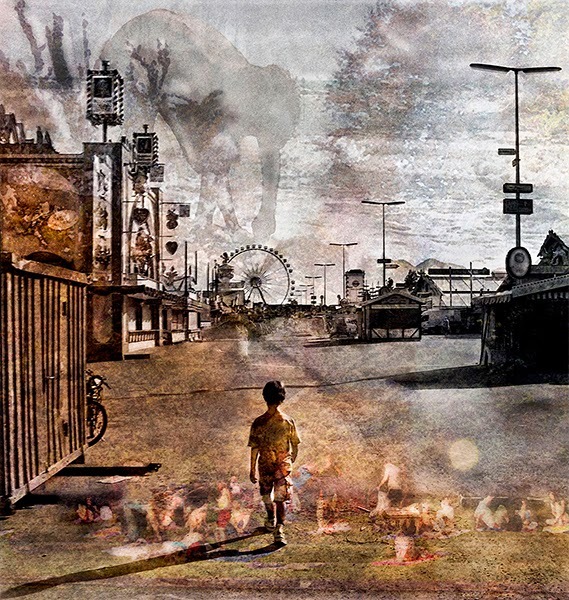 The English-born Pasch, who first moved to Germany in 1990 and has lived and worked in Munich since 1999, is multi-talented; in addition to being a photographer and an illustrator, Pasch also is a poet, a storyteller, a filmmaker, and a "mobile alchemist". Currently, he is producing an online multimedia project, "53 Fragments". At Artist Watch, you will find eight of Pasch's digital photographs, as well as his Artist Statement and Process and Presentation Notes. A brief biography makes note of several upcoming exhibitions, including StAnza 2015, an international poetry festival in Scotland. Don't miss a chance to visit his Website, where you'll find many more lovely examples of his work. Each offers wonderful narrative possibilities. Begin your day with this beautiful animated music video, which was created by Hungarian Balazs Simon for Nils Frahm's "Re" from the album Screws (2012). Frahm's record label is Erased Tapes. clearly hiding from his hon. dares Rossetti to have some fun. but Teasdale's there along with Yeats. and Rich dives in, in the moment dwells. Old Eliot's Cheshire cat just gloats. how Plath is jazzed by Langston Hughes. Not Poe? Alas, the raven squawks anew. Levine's in rain in Ford Highland Park. and Rankine spins, another cop's got hold. and Berryman's Henry, spellbound, holds sway. he's not into dream songs in his 'hood. haiku's great masters to nature resort. but most to teaching; it pays, you know.
. . . to be selected, first of all, is just humbling and an honor. and also engage the public more in poetry. Kimberly Blaeser is Wisconsin Poet Laureate for 2015-2016. Her appointment was announced January 7 by the Wisconsin Poet Laureate Commission. Blaeser succeeds Max Garland (2013-2014) and Bruce Dethlefsen (2011-2012). Information about the position is found in my Monday Muse profiles of Dethlefsen and Marilyn L. Taylor (2008-2010). Blaeser has indicated that as the state's ambassador for poetry, she wants to meet more Wisconsin poets by inaugurating a monthly radio-show of interviews at which the poets also read their work. * In addition, she wants to produce an anthology presenting all of Wisconsin's poets (she thinks too few are known to the public) and show how fun poetry can be by introducing it in restaurants or other venues, such as sporting events, flower shows, wildlife refuges, an annual bird festival, museums, even taxi cabs (see the "Hybrid: Transported by Word and Image" project), and promoting it on social media. In the commission's news release about her, Blaeser is quoted as saying that "[at] some point in the history of this country, poetry got a bad rap. Those who love poetry, but especially those who read or pen poetry in private, need permission and encouragement to be the shining poetry nerds they may long to be!" Kimberly M. Blaeser, Ph.D., a Native American (Anishinaabe/Chippewa) poet, critic, essayist, playwright, and fiction writer, has published to date three collections of poetry: Apprenticed to Justice (Salt Publishing, 2007), Absentee Indians and Other Poems (Michigan State University Press, 2002), and Trailing You (Greenfield Review Press, 1994). The latter received the Diane Decorah First Book Award (1993) from Native Writers' Circle of the Americas. Blaeser also is the author of the critical study Gerald Vizenor: Writing in the Oral Tradition (University of Oklahoma Press, 1996). In addition, she wrote the introduction to Diane Glancy's War Cries (Holy Cow! Press, 1997) and edited Stories Migrating Home: A Collection of Anishinaabe Prose (Loonfeather Press, 1999) and Traces in Blood, Bone, and Stone: Contemporary Ojibwe Poetry (Loonfeather Press, 2006). She has published essays in Here First: Autobiographic Essays by Native American Writers (Random House, 2000), Women of White Earth (University of Minnesota Press, 1999), and As We Are Now: Mixblood Essays on Race and Identity (University of California Press, 1998), among other publications. She wrote the play The Museum at Red Earth, performed in 2007 at Menominee Casino Resort. A "poet of witness", Blaeser writes about Native American themes, especially women, motherhood, and family, Native identity, history, and stories passed down orally, exile and loss, spiritual sustenance, nature and the natural world, and place. She also makes use in her poetry of her personal experiences, humor, and irony to relate what it means to be a Native American. Following are several excerpts from Blaeser's lyrical and narrative poems (I've included one haiku); note the vivid images and depth of observation, the awareness with which she uncovers and so honestly portrays what it means to be Native American. Poems by Blaeser have appeared in numerous literary periodicals, including Akwe:kon Journal, Canadian Literature Quarterly, The Cimarron Review, The Cream City Review, Luna: A New Journal of Poetry and Translation, Nebraska English Journal, Northeast Indian Journal, Sentence 7, Steam Ticket: A Third Coast Review, South Dakota Review, Valparaiso Poetry Review, and Yellow Medicine Review. According to biographies or other profiles, Blaeser has performed or given readings in at least a dozen countries at more than 200 venues. Among Blaeser's honors are a Newberry Library Research Fellowship (1985), a Wisconsin Arts Board Fellowship in Poetry (2001), a Wordcraft Circle Writer of the Year Award in Creative Prose (2002), and a Storyteller of the Year Award (1999) from Wordcraft Circle of Native Writers. One of Blaeser's poems is installed as a sculptured doorway in Milwaukee's downtown Midwest Express Building, now known as Wisconsin Center. A professor of English and creative writing at University of Wisconsin in Milwaukee, Blaeser also teaches classes in Native American literature and American nature writing. 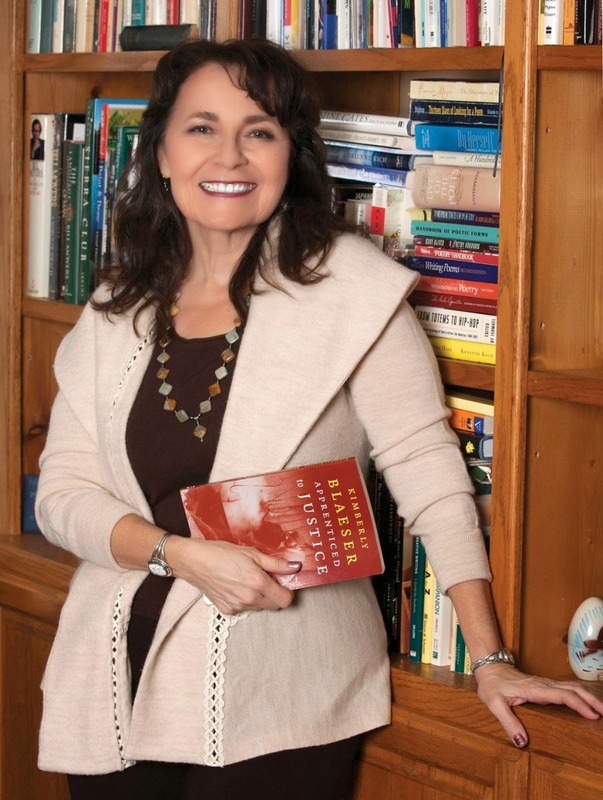 She serves on a number of editorial boards overseeing publications or studies of Native literature. Blaeser, who grew up on White Earth reservation, is an enrolled member of the Minnesota Chippewa Tribe. * For a more in-depth response to doing "the minimum official thing" versus realizing her vision for the position, see the excellent Express Milwaukee interview with Selena Milewski. Blaeser also talks about the role of place and its inspiration, her artistic philosophy, and her work with the Native American Literary Cooperative, which Blaeser founded. Her advice to aspiring poets is to read and pay attention, to "see things close up". Another narrative profile is in the 2005 edition of The Greenwood Encyclopedia of Multiethnic American Literature (see the profile on GoogleBooks).